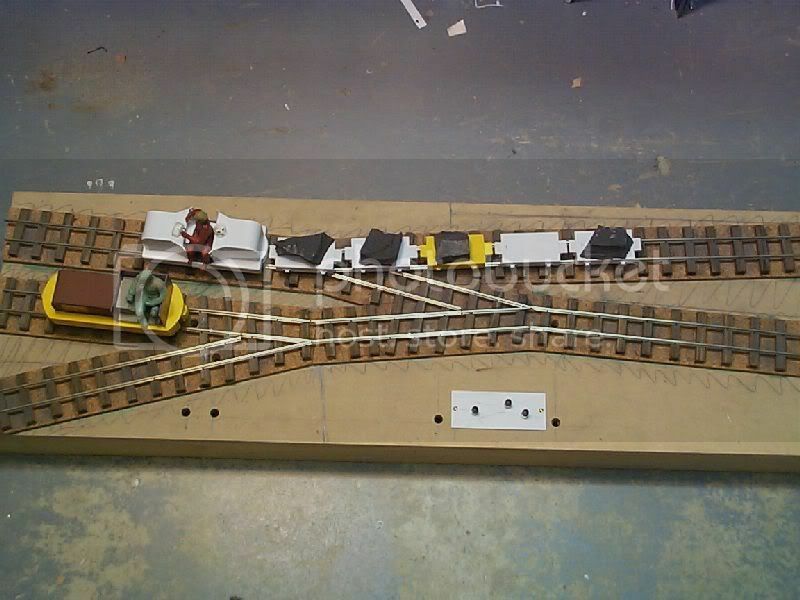 I have managed to throw together a small layout with 3 kick switches to see how it would work. Steves question about the polarity of the kick rail is not a problem because the rail goes beyond the normal pivot point the exit rails do not actually form a frog and are not touching basically isolating them from each other. The kick rail is powered from the outside rail as it makes contact. 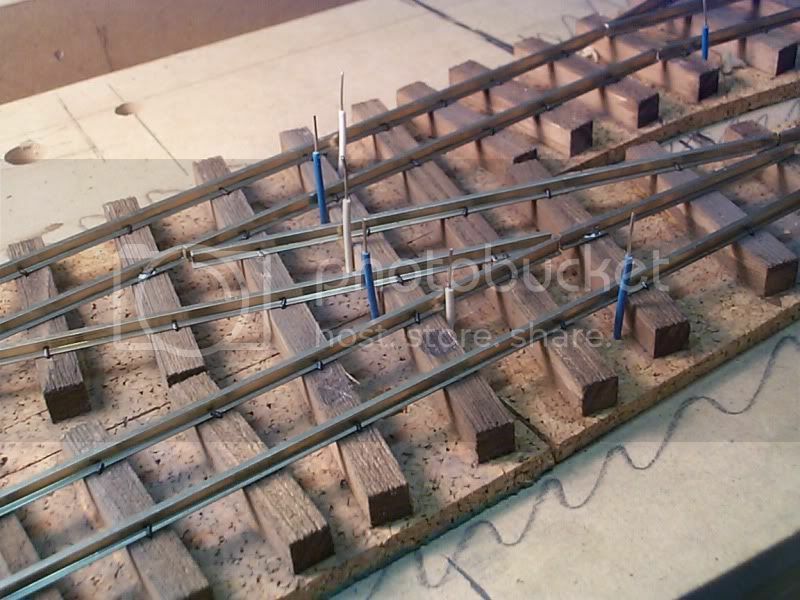 For the test it works well, I will provide some way of keeping the rail sprung agains the outside rails with a spring arrangement under the top sort of like the way a house switch clicks over. The rail changes polarity automatically as it contacts either rail. "Look Ma No hands"
I will put up a web page now that all the main work of wiring and isolating switches is done. All the connections are soldered to the sides of the rails. the basic premise of the layout is a loading station on the long sidings and the middle siding opposite is a corrugated tin loco shed. the traffic comes into the loading area and a shipment can be readied on the opposite siding. 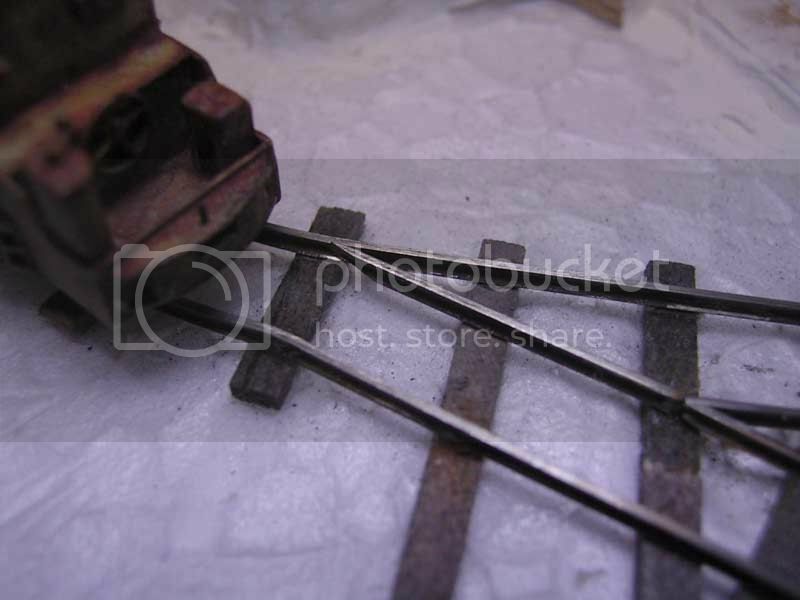 so there is an inglenook quality to the shunting and rearanging the wagons using two locos. The bogie locos work best at the moment until I get the kick rail sprung. the little battery loco works ok as long as the rail is kicked over tightly. 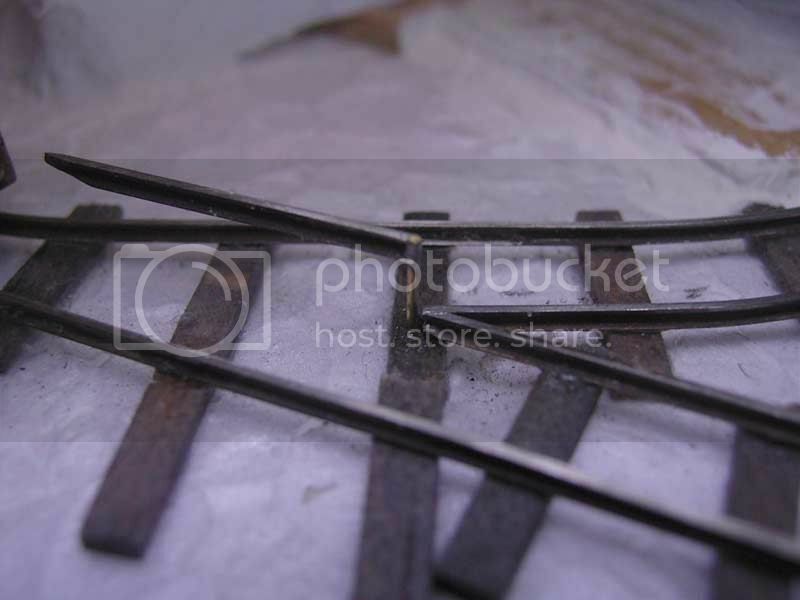 The rail is all spiked using a small tube pusher made up from telescoping brass tube and a magnetized steel pin inside. 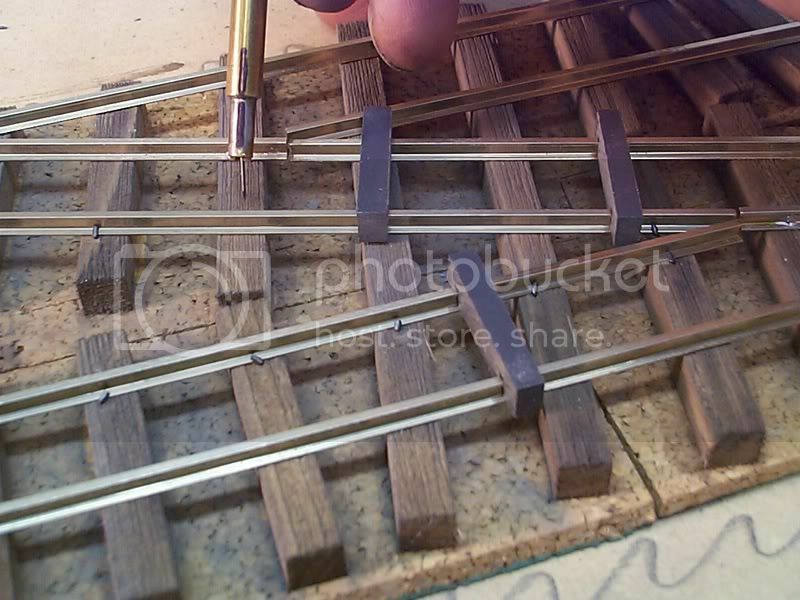 The sleepers are 1/4 inch square spruce softwood lumber and the rail is code 125 nickle The beauty of using full thickness sleepers is the spikes push in so easily and hold well without slitting the wood. This image shows the entire layout 29.5 inches long X 9 inches wide. I will now install the uncouplers. Last edited by michael on Wed Aug 25, 2010 6:22 am, edited 2 times in total. Unbelievable! No sooner is something mentioned than it's built! I am in awe, Michael! I'm going away now to think of some really impossible task to casually mention on this forum, just to test you!! to grips with laying shop-bought track, I'm going to have to have a go at this hand laying lark at some point aren't I? At least this time my impressionable mind doesn't want to follow suit. Not just yet anyway. Still interested in building regular pointwork with straight rail though. You Know Ian, that thought had crossed my mind But I have to admit that I am incredibly lucky in that I have a lot of materials at hand, and I have been working at modelmaking on and off for a living for nigh on 40 years. There are not too many tools that I don't have. One of the things that ones needs to deal with on a commercial basis is speed because unfortunately time is money in this fast pased world (I don't fully subscribe to that edict) as I have often taken far more time than needed sometimes to do a satisfatory job whether I am paid or not for the extra hours. So it is not a fair comparison vis a vis getting something done fast. If I had to do this work at a kitchen table or a computer bench with a very limited number of tools I would find it much more difficult to do things quickly. Martin If Ian thinks he's impressionable then I am at least twice as immpressionable I don't need any more challenges at the moment I need to get some work done. This whole GN15 thing was just a diversion from my 30mm scale stuff and now look what has happened Ive been had hook line and sinker, and I keep thinking about the "bee and ant" Like Klaus has said a few times there are way too many diversions on this forum . Thats great Michael but now your figures are all going to need steel toe boots! 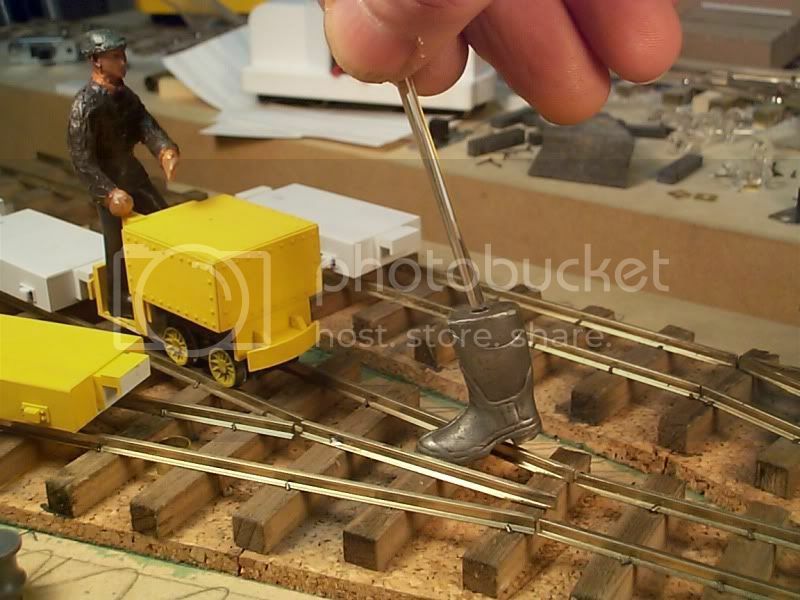 How are you going to model your guys kicking the center rail? That last bit was for MOG maybe that will have Michael perplexed for about .. well likely about 20min. the way he works. So now I have to come up with a new layout to incorporate those kickswitches because I do like the look of those. Are you using the "hand of God" method or are you going to make some under board type throw? I think a tiny boot with some sort of scissor type mechanism would be most prototypical. Scott I was actually hoping that someone out there had seen some form of mechanical switch lever, Come on Steve there must be something in your amazing library. I'm not sure about those steel toed boots on the plastic firemen drivers. Dont they already have some? Didnt Klause post a picture of the steel toed sandals some time back? I am thinking that the loading unloading area will be using the fabulous cases that Andy made, I just printed one up they are great! michael wrote: Scott I was actually hoping that someone out there had seen some form of mechanical switch lever, Come on Steve there must be something in your amazing library. I'm not sure about those steel toed boots on the plastic firemen drivers. Dont they already have some? Didnt Klause post a picture of the steel toed sandals some time back? I am thinking that the loading unloading area will be using the fabulous cases that Andy made, I just printed one up they are great! For the later I have no idea yet, for the first option, well what about a switchmaster switch machine. Just solder the point rail (switch blade) to a sturdy brass tube as a pivot and attach an arm below the base board to drive the rail. The travel does not need to be limited as the switchmaster runs dead on the end of each travel. As I'm too lazy to build normal switches I would seriously give it a try but the my last two attempts were not successful. I must admit that I just build a right hand turnout free hands with out measurements . Any critical dimensions that I need to observe, diverging angle etc. I quite like the Big boot from the sky idea... a scale modelled steel toe cap boot on the end of a stick.. perhaps a transparent swizzle stick? MOG wrote: I quite like the Big boot from the sky idea... a scale modelled steel toe cap boot on the end of a stick.. perhaps a transparent swizzle stick? I might just use it. here is the big boot from the sky on a transparent swizzle stick. I Must resist these challenges I Must, I must , I must. Last edited by michael on Wed Aug 25, 2010 6:25 am, edited 2 times in total. Steve, you've got a wonderful library, but how do you know God's boot size? David Nix wrote: Steve, you've got a wonderful library, but how do you know God's boot size? I said steel TOE, toe, not boot, ha thought you got us didn`t you Michael. OK you did get us. Thanks for the compliment Alastair. and everyone else. I did take a lot of pictures as I built it and I will be organizing them on the web site. To answer Klaus' question re the kick switch dimensions I simply printed three copies of the drawing I posted and placed them on the base board. Then worked out from there. 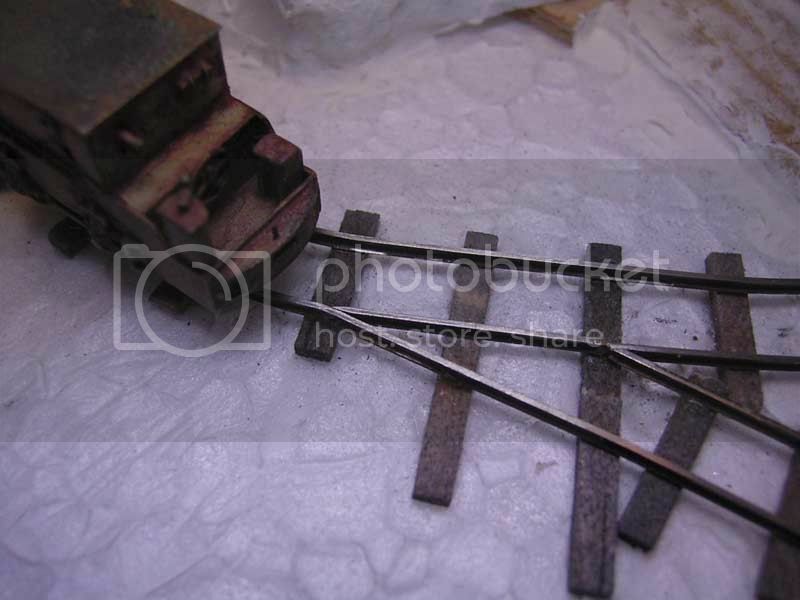 Why don't you use some sort of indexed harp switch stand similar to what was used on D&RGW-NG? Great layout Micheal, I'm both truely inspired and awed. I noticed talk about kickswicths on the Gn15InfoBBS yesterday. Your e-mail is good timing! I built some kickswitchs on HOn20(1/87 5.8mm gauge). I think blare length good as 3.5 to 4 times longer then gauge. I think 3 times long for Y switch too. I attached some photos of a kickswitch on my new HOn20 pike. It blade length is 20mm, gauge is 5.8mm. You can free to use attached photos for kickswitch funs! I suggest to you make 60 to 70mm length blade for Gn15(16.5mm) track as good. As for electric contacts, it electric connection by the blade only, however no problem. He was also kind enough to include some pictures of the switches, I can't figure out how to past them into this note, but I could e-mail them to you if you were interested. ChrisMears wrote: He was also kind enough to include some pictures of the switches, I can't figure out how to past them into this note, but I could e-mail them to you if you were interested. Chris, if you want to email them to me I will be happy to put them online and link them into this thread. I would like to see them and I'm sure others would too. Here are Hiromi's photo's. I have reduced them in size a little, hopefully they will fit the page a bit better. Steve Bennett wrote: Here are Hiromi's photo's. I have reduced them in size a little, hopefully they will fit the page a bit better.